We’ve made Panopto even better. Again. Today we’re rolling out a number of new features to our video platform. Just a few short months after our March release added Smart Search, Branding, and an Android app, our new update adds a host of improvements suggested by our customers, including new video workflow functionality, updates to our API, the ability to run Panopto from an external USB drive, and improved integration with Instructure Canvas. When you finish a Panopto recording or upload pre-recorded videos into a folder on your Panopto server, the default behavior is for those recordings to automatically become immediately available to anyone with viewing access to the folder. Sometimes, however, you want to specify when videos should become available for viewing and how long people may be able to view them. For example, a faculty member may want to make some course videos unavailable at the end of the semester. Or an organization may want all videos in a folder to be reviewed and approved before they’re made available. So we’ve solved for that. Panopto now includes the ability to set availability windows both for folders and for individual videos. 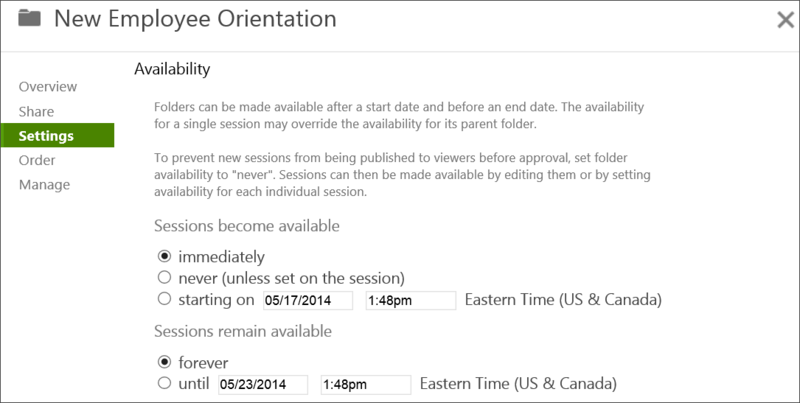 Availability windows are accessed through the settings dialog box, and allow video creators and administrators to specify dates and times for when sessions become available for viewing, and how long they remain available. Panopto allows you to sort videos based on their name, creation date, duration, folder location, and rating. Now, you can also drag-and-drop videos in any folder to create a custom sort order. This is helpful when recordings are meant to be watched in a particular order, as is often the case with training courses and lecture series. When you reach the end of one video, Panopto will also link to the next one, making it easier to navigate an ordered video series. There are times when you want to record a video presentation using Panopto, but the person giving the presentation doesn’t have Panopto installed on their laptop. This often happens with guest lectures and with some corporate events. In the past, you had two options. You could either copy the speaker’s presentation to a laptop that has Panopto installed, or you could install Panopto on the presenter’s laptop. Now there’s a third option. You can run Panopto from an external USB drive. Today’s update includes a self-contained version of the Panopto client software that can be copied to a USB drive. When the drive is plugged into your speaker’s laptop, they can run Panopto directly from the drive without installing any software onto their laptop. By default, recordings are stored on the USB drive, so at the end of the presentation, you can simply unplug the drive and take the recording with you. Panopto supports the ability to batch upload large quantities of video by simply dragging and dropping files into a web-based upload tool. In today’s release, we’re adding the ability to programmatically upload videos using a new upload API. 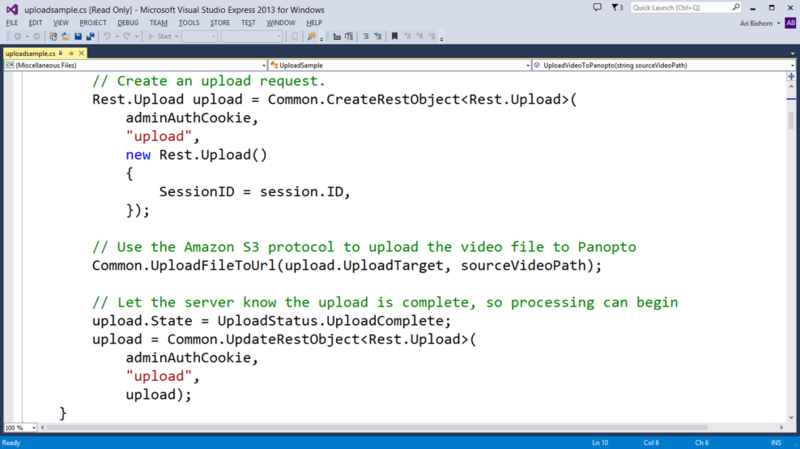 The new REST-based API makes it easy to import existing collections of video into Panopto. It also enables organizations to upload recordings into Panopto as part of an existing video content workflow. If you’ve ever wanted to embed a Panopto video into Instructure Canvas assignments, announcements, discussions, quiz questions, and more, it’s never been easier. The May 2014 Panopto update includes an improved Canvas integration that allows you to embed a video nearly anywhere in Canvas simply by clicking on a Panopto icon in the Canvas editor and selecting the video. See what’s new with Panopto for yourself! If you’re interested in learning more about the latest Panopto update, or about how Panopto can help your organization use video for learning and communication, contact our team for a demo, or request a free trial of our software.